Manage users and role permissions visually through the OpsCenter UI. OpsCenter provides the ability to define custom, fine-grained access roles for users. Instructions for enabling role-based authentication in OpsCenter. Describes logging in and out of OpsCenter and changing the default admin password when OpsCenter authentication is enabled. Change the default location of the password database used for OpsCenter authentication if you prefer another location. Configure the algorithm to hash user passwords for OpsCenter authentication. Follow these steps to manage users and roles permissions in OpsCenter. Important: When LDAP authentication is enabled, adding and editing users is disabled. Only role editing is available when LDAP is enabled. Log in to OpsCenter as an admin. 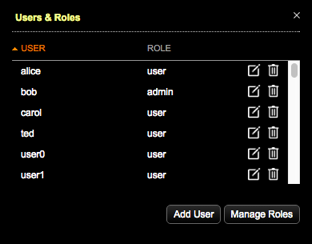 Click Settings > Users & Roles. The Users and Roles dialog appears. Click Add User. The Add User dialog appears. Enter the username and password, and select a role for the user. Click the Edit icon for the user you want to edit. To change the user's password, enter and confirm the new password, then click Save. To change the user's role, select the new role from the Roles list and click Save. Click the Delete icon for the user you want to delete and click Delete to confirm. Click Manage Roles. The Manage Roles dialog appears. To edit an existing role, click the Edit icon. The Edit Role dialog appears. Select the cluster to apply role permissions to. The first cluster that a role has permissions for is automatically selected in the Cluster list of the Edit Role dialog. Select the options the user role has permissions for. To hide a cluster for users within a selected role, uncheck all permissions. Tip: Click Select All or Unselect All to quickly enable all or no permissions. Note: All changes to roles and permissions are logged for security auditing purposes. To apply role permissions for each cluster, repeat 2.a through 2.e. Click Add Role. The Add Role dialog appears. Enter the name of the role in Role Name, select the permissions from the appropriate feature check boxes, and click Save. By default, new roles do not have any permissions. Repeat as appropriate for each cluster. In the Users dialog, click the Edit icon for the user you want to add to the role. In the Role list, select the role, and click Save. Edit the role to apply its permissions to each cluster as appropriate. Select the role you want to delete in the Manage Roles dialog.